Bret Michaels has worn a lot of different hats throughout his career. He first came to the public’s eye as the lead singer of the group Poison. During his time with Poison, they sold over 30 million records worldwide and had a number one single on the Billboard charts, Every Rose Has Its Thorn. He embarked on a solo career with moderate success and then began appearing in movies and on television shows. One of those shows was Nashville Star (sort of a country American Idol show) on which he appeared as a judge. He formed a film production company with our old friend, Charlie Sheen, back in the mid 1990s and the duo produced several (forgettable) movies. And because there are never enough bad reality shows on television, Bret Michaels starred in a dating competition show called Rock of Love with Bret Michaels in which various women competed for the ultimate prize of being the chosen one of Bret Michaels. It was so successful – as in the winner in the first season decided Bret Michaels wasn’t right for her – that it was followed up by 2 additional seasons, including a version that took place with the contestants living on and traveling with Bret Michaels on his tour bus. How could that possibly not lead to a long-term relationship? Following that, Michaels appeared on and ultimately won season 3 of Donald Trump’s Celebrity Apprentice. As a diabetic since the age of 6 and a concern that one of his children was pre-diabetic, Michaels played for the American Diabetes Association while on Celebrity Apprentice and raised $640,000 for them. He’s just released a new album Jammin’ With Friends in which he duets with such singers as Loretta Lynn, Edwin McCain, Ace Frehley and Lil Jon (one of his competitors on Celebrity Apprentice). He’s also now starring in another new show on the Travel Channel called Rock My RV in which Michaels and a team of custom RV designers crisscross the country looking to transform ordinary people’s RVs into “the most outrageous, badass, hooked-up mobile mansions on the road”. 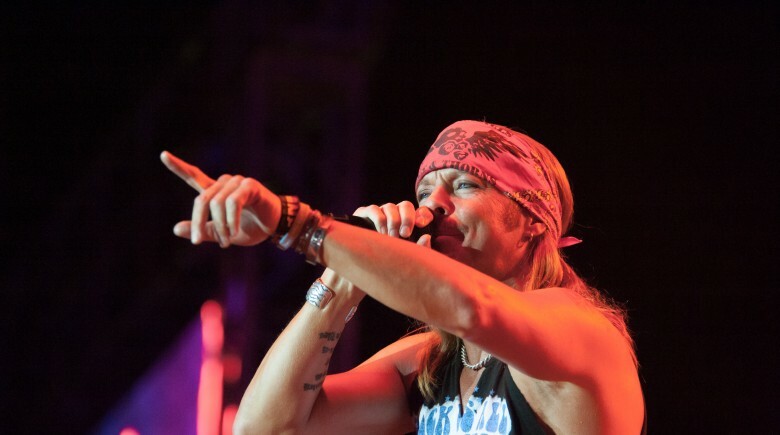 Recovering from a number of health problems over the past few years, he began the Bret Michaels Life Rocks Foundation to support a number of charities that he felt passionately about. As part of a military family, the foundation raises money for the Wounded Warrior project (which raises awareness for and provides assistance to injured service members). He’s also designed a series of pet products (the Bret Michaels Pets Rock Collection) sold exclusively at PetSmart that raises money to help support pet adoptions. And his foundation donated a hospitality and music room at St. Joseph’s Barrow Neurological Institute in Phoenix, the hospital that Bret Michaels credits with savings his life after he suffered a brain hemorrhage in 2010. But the majority of his charitable work through the foundation focuses on diabetes. As a lifelong diabetic, he works to raise funds to fight the disease as well as send children with diabetes to camp each summer.